Posted by Candie Kates on Sep. 8, 2017 17:15:50. Call history is a private staff and some time you don't want them to be seen by others. So you decided to remove them by tapping the delete button. However, you are certainly WRONG if you though the delted items gone forever. Actually, these deleted call logs are still stored in your phone memory but they are just not shown to to you. Some Android or computer genius can retrieve this information in seconds and discover all your personal contacts, messages, notes, etc. So if you really care about your phone's privacy then with due all respect, you need to destroy them permanently so that no one can ever find these details again. In this guide, we will show you 2 ways to delete calls logs on Android smartphones that can be used either for personal use or in the event of selling or donating your Android phone. This part is only valid for personal smartphone that has no secret information. Please follow the steps below to get rid of single or multiple call log entries from your smartphone. But remember this is not a permanent way to erase call logs from your smartphone, so only use it for personal purpose only. Step 1. Unlock your smartphone and open the phone call app. Step 2. Go to the call logs and long tap on the contact detail that you want to delete. Step 3. Press Delete again to erase the single call log from the call history. Step 4. If you want to delete multiple entries then click on "More" from the top right corner and tap on "Delete". Step 5. 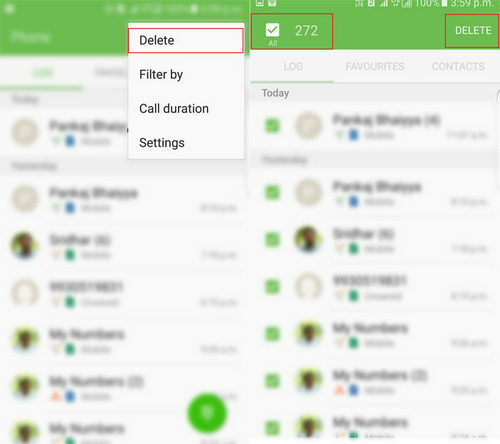 Now, select all the call log entries that you want to erase or tap on "All" to select them all and click on "Delete" to confirm. This should totally clear the call log from your phone. 1. 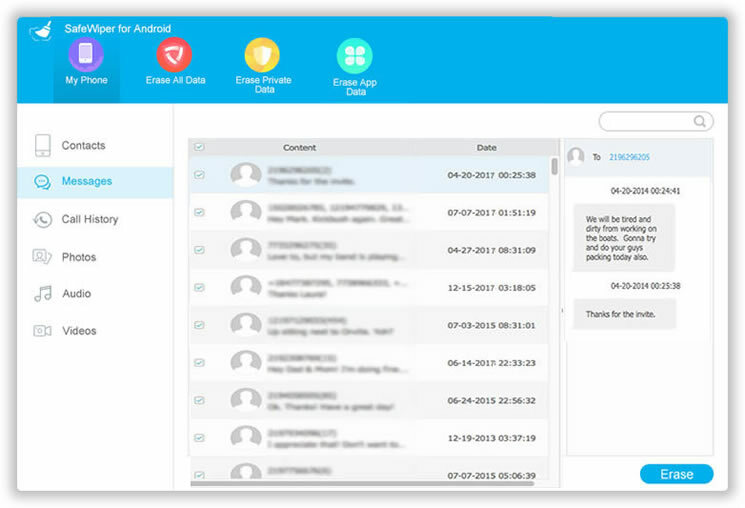 Like we mentioned, it is not a secure way to erase call logs from your phone, they can be still recoverable. 2. Not a safe method if you are selling or donating your phone. If you want to learn the ultimate way to erase call logs from your phone that computer experts or even government can't recover then a professional Android data erasing tool will be a perfect solution because they erase the call logs and then rewrite the empty space with random junk files so that no traces are left behind. Right now, the best Android data erasing tool available on the internet will be TunesBro DroidWiper. 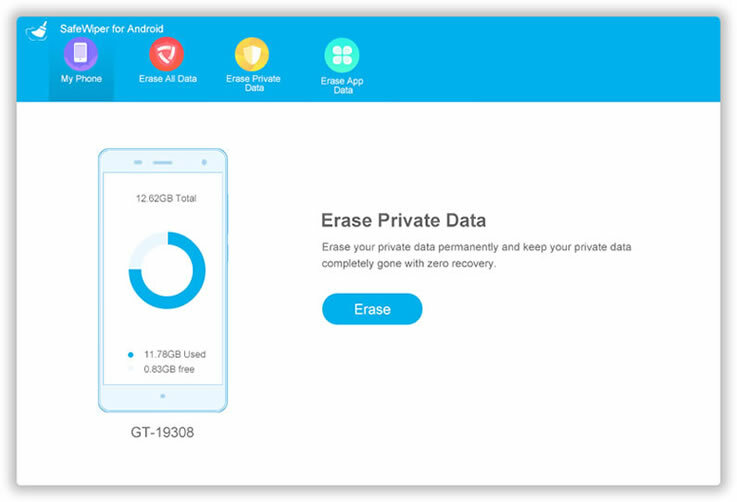 The developer team has designed this software to permanently erase anything from your Android phone that no one can see again including pictures, music, videos, contacts, call logs, apps, etc. The data deletion is permanent with this software and not even paid data recovery software could recover the files deleted by this data erasing tool. This software uses top secret algorithms to permanently destroy information from your phone that are currently used by military and government to keep data classified from intruders. Erase all content and settings from Android phone or tablet. Free up more storage to boot the phone performance. The first step is download the program on a computer and install it later. After that, double click the desktop shortcut to open the program. 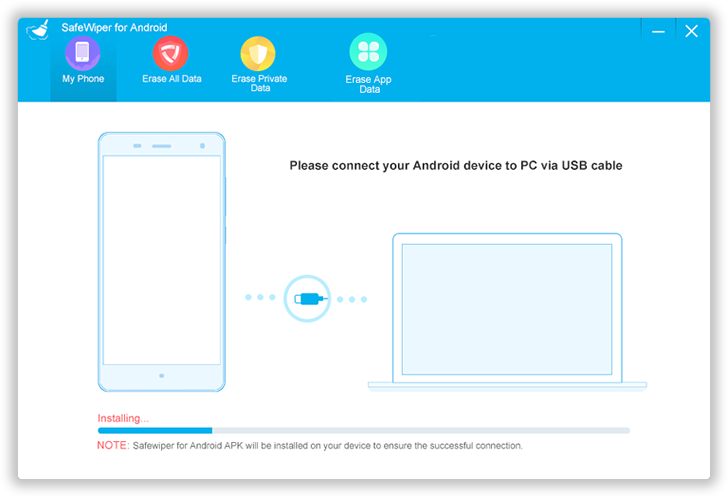 The second step is to connect your phone to PC with a USB data cable and launch the program to begin the deletion operation. Enable USB debugging mode on your Android phone by going to Settings > Developer Options > Turn on USB Debugging Mode. TunesBro Android Manager provides 3 ways to delete data, so choose "Erase Private Data"and click "Scan" button. The program starts to scan all the data on the phone. Later, select the data type that you want to scan and delete. For this particular tutorial, we are choosing "Call Logs". Now, click on "Erase" and select the data erasing technique from the 3 options available. You can choose any of them as all of these options will permanently destroy the calls logs from your phone. Finally confirm the process by typing "Erase" on the prompted window and say good bye to your call logs forever. It is very crucial to permanently delete data from your phone so that no one can steal and misuse it against you. TunesBro Android Eraser is the perfect software to completely delete all kinds of data on your Android phone and you can even use this software to keep your phone clean and organized. This tool is highly recommended especially for those who are selling or giving away their phones to strangers to maintain the security and privacy of your own identity. If you are still in confusion if this software works or not, then don't hesitate to download and try it for free and check the software potential by yourself.